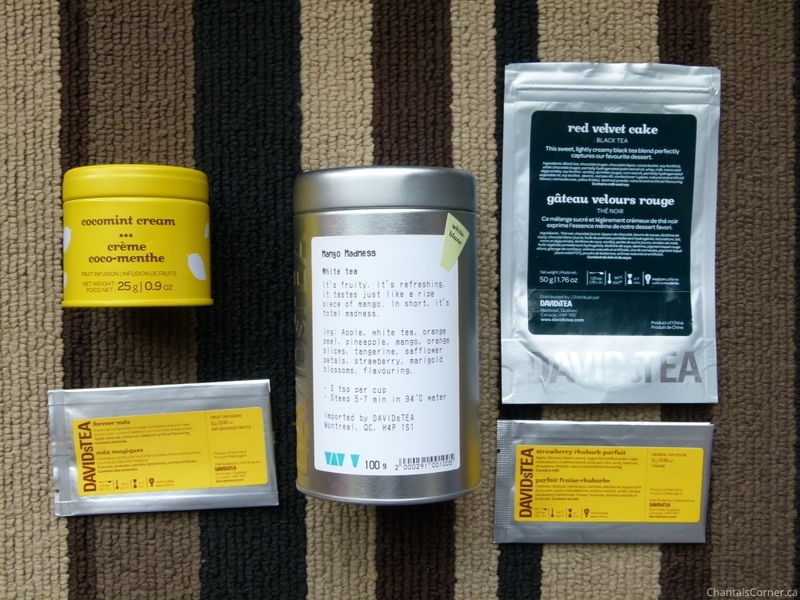 It’s been over a year since my last Tea Empties so this one is WAY overdue. 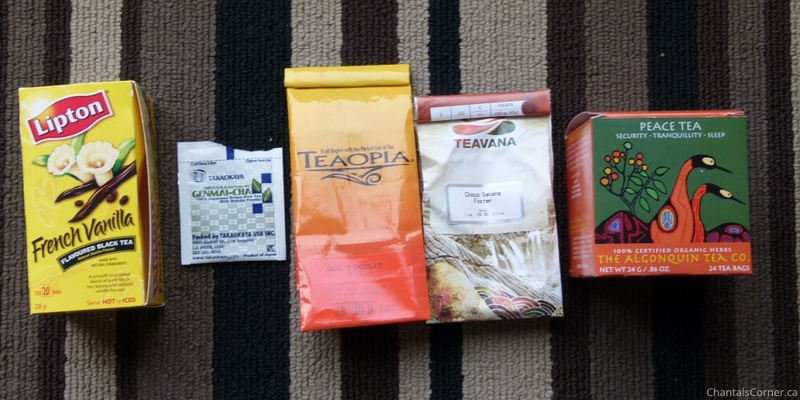 I did not drink that much tea for the first part of 2015 because I was on maternity leave until May 2015. I just didn’t take the time to make tea since I usually forgot about it until 2-3 hours later when it was all cold. I started drinking tea on a more regular basis at work because I always get chilly with the air conditioning. And now it’s winter so a good hot tea (or two, or three) on a cold winter day just feels so good! 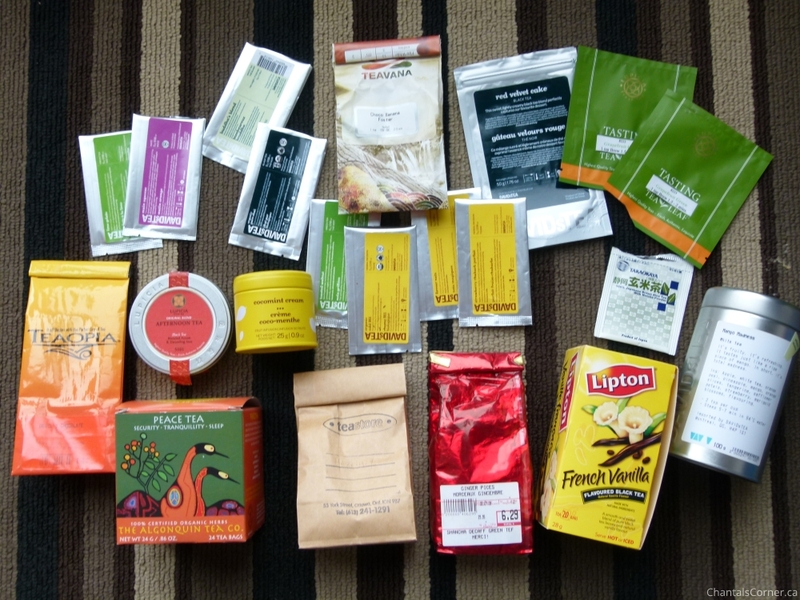 My tea collection was a mess so I finally did a cleanup during my Christmas vacation and now I’m ready for an empties post! I should do an update on my stash as well so you can see where I’m at compared to when I started. I’ll work on that… But for now, here’s what I finished since November 2014. DAVIDsTEA “Cocomint Cream” (herbal) This tea was really good. It definitely tasted minty, in a rich creamy kind of way. It will go bad though so don’t keep it for too long. I had not had it in a few months and when I went to make some it smelled funky so I threw out the rest. I didn’t have that much left though, thankfully. DAVIDsTEA “Forever Nuts” (fruit infusion) OMG this is DELICIOUS! Once I started drinking it I could not put it down and it was done in 2 minutes. It tasted nutty with a hint of fruity, like some nutty dessert bread. SO. GOOD. I ordered some, and am almost done that too. DAVIDsTEA “Mango Madness” (white) This tea tasted light and fruity, it was really good. DAVIDsTEA “Red Velvet Cake” (black) I don’t remember too much about this tea because it’s been a while since I finished it, but I remember that it had a nice sweet taste to it and I really enjoyed it. DAVIDsTEA “Strawberry & Rhubarb Parfait” (fruit infusion) I wasn’t sure if I’d like this one or not, even though I do like strawberry & rhubarb pie, but I loved it! I found it tasted more like strawberries, with a side note of rhubarb. Really yummy. Lupicia “Afternoon Tea” (black) I don’t remember how this tea tasted, but I remember that I liked it. Lupicia “Grapefruit Green” (green) I’ve never been a fan of grapefruit, there’s just something about the taste that I don’t like. I don’t hate it and will have it if I have to (if there’s nothing else), but if there are other options I wouldn’t pick it. That being said, I wasn’t excited to try this tea, but still gave it a go. The grapefruit taste is there, but it’s not too strong and I somewhat enjoyed it. 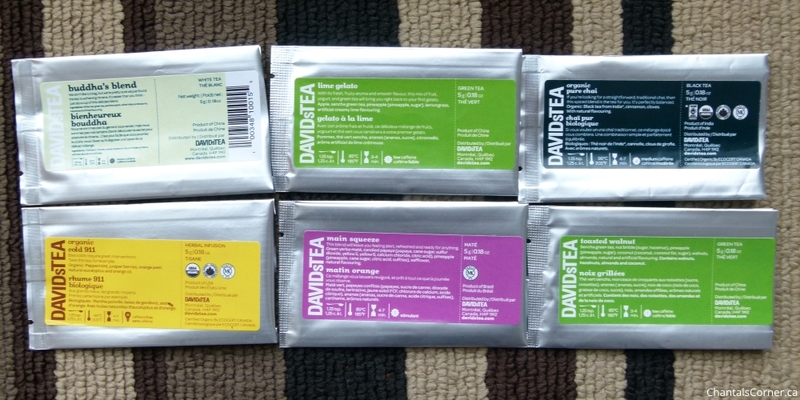 I wouldn’t buy the tea, but I would drink it if it was offered to me or I received more samples. Lipton “french vanilla” black tea (black) It smelled like french vanilla and tasted like it too, it was good. Lychee Black Tea (black) I completely forgot to add this one to my pictures! 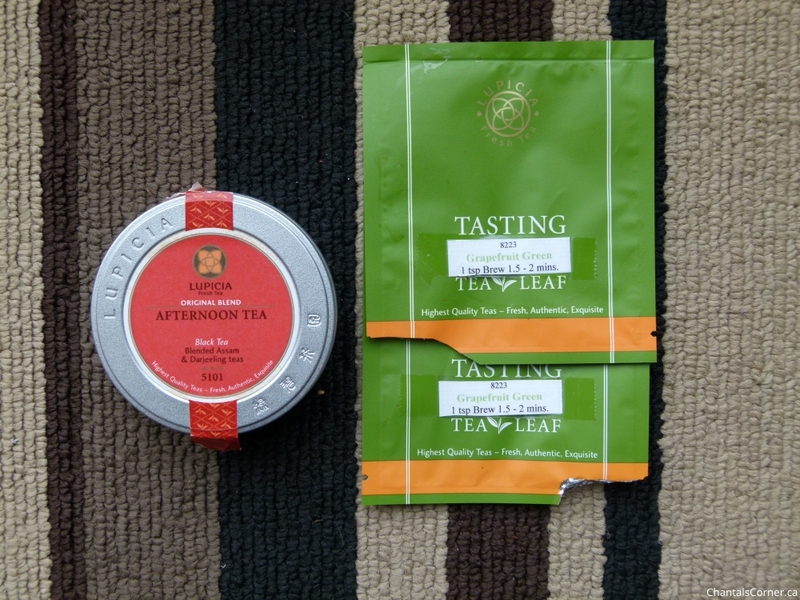 This is my second tin that I finish, the first one appeared in my previous Tea Empties in case you want to see what it looks like. I really enjoyed this tea; it has a nice lychee taste to it. Takaokaya “Genmai-Cha” (green) This one smelled more than it tasted, but it was still good. This was my fault though because I used a cup that was too big so it was too diluted. Teaopia “Devil’s Chocolate” (rooibos) This tea didn’t taste as chocolatey as I thought it would and it had a punch to it that I did not expect. It was like a spiced chocolate, but not spicy in the sense that it burns your mouth, just in taste. It wasn’t my favourite. My husband hated the smell of this one so he was quite happy when I finished it, hehe! Teavana “Choco Banana Foster” (herbal) This tea was really good, I quite enjoyed it. The Algonquin Tea Co. “Peace Tea” (herbal) I really enjoyed this tea because I found it tasted different than your typical sleeping teas. 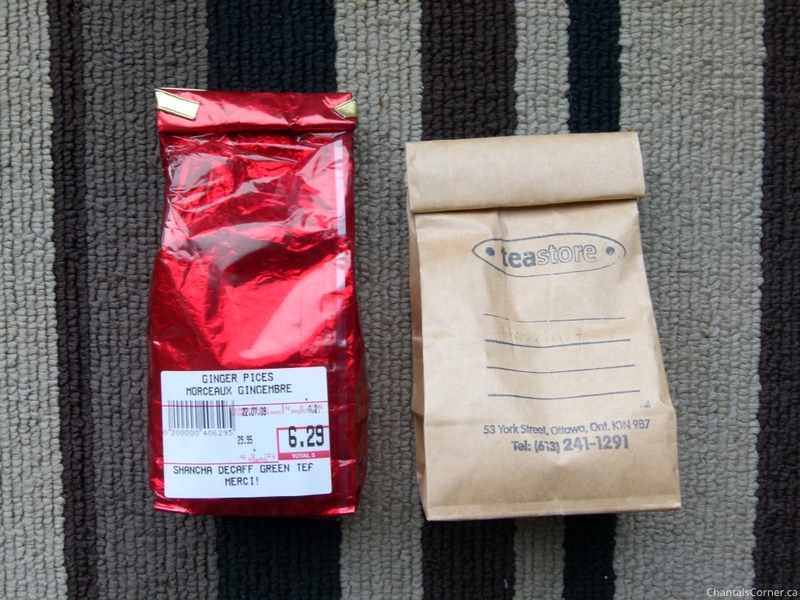 These two teas I’m throwing out. The ginger pieces shancha decaf green tea tea I got from my father after my mother passed away. I’ve honestly never tried it, but I’m not a huge fan of ginger so I’m not even tempted by it. And the teastore “hazelnut” I’ve had for probably 15 years, and have not had it in over 10 years, so it’s time to throw it out. That was a good cleanup! I’ll try to take better notes of my empties next time so I don’t have another bunch of “I don’t remember”. Would I buy any of these again? Probably, but not right now because I have lots of tea I still need to drink.